This is a stunning line up of wines from one of the Austrian giants, whose fantastically elaborate labels were memorably (and incorrectly) described to me once as the 'exploding Jesus'. 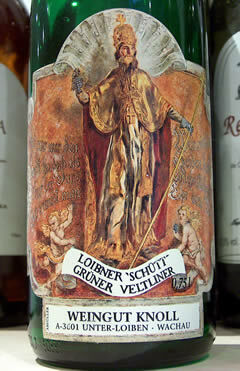 Actually, the label depicts not Jesus, but St Urban, the patron saint of wine growing. Based in Unterloiben in the Wachau, Knoll have plots in many of the leading vineyards of the region, totalling almost 15 hectares in all. Emmerichs II and III are currently in charge of this family-run domaine. The notes below are from two tastings, the first in February 2008, and the second in 2006.